Kundalini Yoga has many phases that it helps a person’s consciousness traverse through, as we journey to the opening of the soul. Sometimes we are happy, sometimes sad, sometimes the past memories come pouring out, other times there are re-adjustments of the brain patterns that take place. No matter what the terrain, keep going back to class or to a place where the Kundalini energy is prevalent. No matter what is happening, I always feel better when I am around the opening of the Kundalini energy. I can breathe better, think better; I feel better. So no matter what, keep your practice going. After all your decades immersed in these teachings, how do you relate to yourself differently now compared to before you practiced Kundalini Yoga? I am a very sensitive being, and growing up in non-spiritual environments, I never felt ‘right’. I always felt out of place – displaced – in a foreign place. I’m sure a lot of us can relate to that. 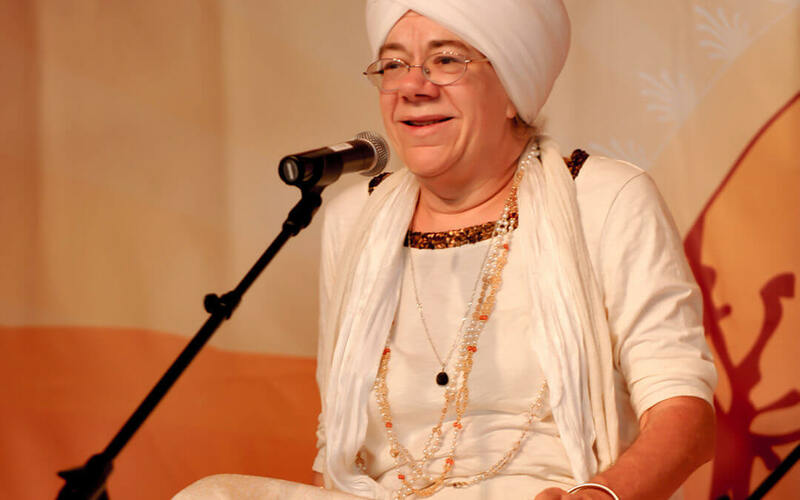 Once I began my journey in the kundalini world, and met my Teacher, Yogi Bhajan, I experienced a sense of hope, that things could be better on the Earth. Of course, when you first start your practice, you see everything through ‘rose colored glasses’ – so to speak. As things normalize within you, the ego gets room to pop up and wants to mess things up. But even through that phase, which all have to go through, I was blessed to keep going. Without all this exposure to the spiritual essence of things, I know I would have gotten very ill and passed on quickly. So in honor of my Teacher helping me, I try to keep up helping others through teaching, and projecting prayers for healing over others. Are there ways that this generation of yogis must be the forklift and elevate the consciousness of humanity in different ways from that first generation that studied with Yogi Bhajan? Or, is this work of spreading high vibrations through Yogi Bhajan’s teachings timeless, beyond trends and fads? Even though there are trends and tendencies within the different generations, the teachings are timeless. But the personality and how to face the current challenges on a universal level will be different in different times. When we first started, there was no internet. But still the word would spread. 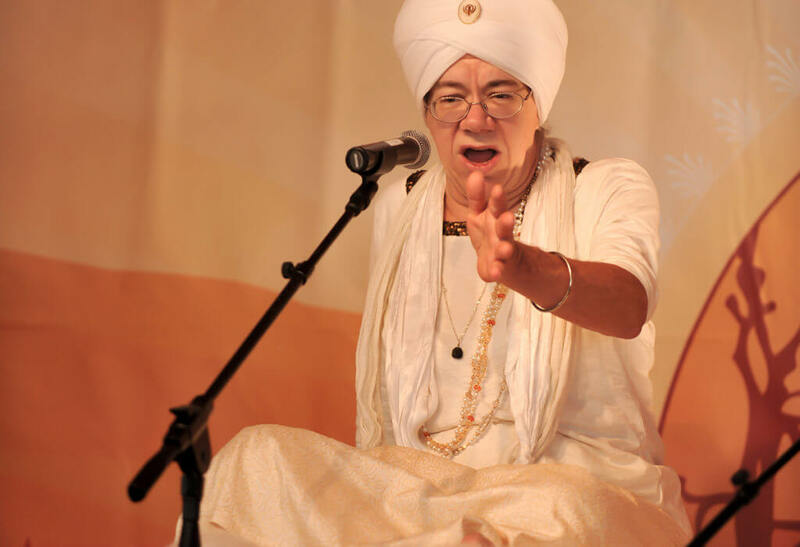 Yogi Bhajan laughed when he told us, ‘Telephone, Telegram, Tell-a-Sikh.’ We were such a close “Tribe” that when a person was engaged, was put on a fast, had a child – all these things were communicated very quickly over the mountains and hills and states and even countries. He told us about the challenges coming as we go into the ‘Information Age,’ and how that would affect our brains, thoughts, and emotions, as well as projection. The instant information exchange is very fast and often shallow or incorrect, and at times intimidating to our own insecurities. And on the other hand, the teachings are being allowed to spread far and wide at a fast pace. Because the teachings are so deep and profound, and the Master is not physically around to put the reigns on our egos, I feel it’s a time of challenge to stay connected to our deeper inner healing and messages. Our Teacher is still present, and yet on a subtle, deep level. It’s important for us to not go shallow, but to feel deeply through the connection of our souls, and relate from there in all we do, and as we Teach. You have been teaching at Sat Nam Fest for many years; have you noticed any changes that give you hope that we are transitioning into a humanity with a deeper, more illuminated collective consciousness? During my times at Sat Nam Fest, I have watched people growing into a deeper part of themselves, excited by the new force that is running through them, and growing in an open hearted soul-to-soul level, as we see and share the sacredness in one another, rather than only viewing the outer shell. Is there anything you would like to say about the ways Sat Nam Fest is a special, sacred, or unique among other festivals / yoga retreats? I am personally grateful to Sat Nam Fest for keeping up and keeping a sacred projection with all of the locations they are opening up to. I watch people in my classes who go and how excited they get that they meet new people and learn new things in the classes as well as from one another. What a great time to build community which is so needed. During the Piscean age, people often existed as a lone wolf. Now in the Aquarian age, as it opens it’s arms to receive us, it’s imperative that we live with each other and for each other. As Yogi Bhajan said, we are all in the ocean, and we have to help one another to get to shore. Sat Nam Fest is allowing this to take place. I am so grateful that everyone is Keeping Up! Tej will teach “Developing Our Higher Sensitivities: Opening Up to the Aquarian Upgrade” on Friday, April 12 from 4:00 PM to 5:30 PM in the Sat Nam Pavilion.